Remove giblets from both cavities at both ends and set aside. Rinse the bird inside and out and pat dry with paper towel. Place a rack into a large roasting pan,and then place the turkey onto the rack with the breast and legs up. Mix all of the seasonings, except the paprika, together with the butter. Place your hand between the skin and the flesh from the rear of the turkey and slide a palm full of butter and seasoning mixture in between the skin and flesh. Then place a glob of butter into the palm of your hand and generously rub the entire turkey with the butter. Generously sprinkle the entire bird with salt, freshly ground black pepper, onion powder, granulated garlic powder, tarragon, parsley flakes, thyme, basil and paprika. Pour about 1/4" to 1/2" of chicken broth in the bottom of the roasting pan, being careful not to wash any of the seasonings off the turkey. Completely tent the turkey with aluminum foil and place into a preheated 325 degree oven for about 1 1/2 hours. Remove the foil tent and wrap foil around the legs and wings. Baste the turkey and return it to the oven for the remainder of the cooking time, which will be when the interior temperature of the bird reaches 180 degrees or until the juices run clear and not red when you puncture the bird between the thigh and the breast. Cooking time will vary depending on the size of the turkey. NOTE: cook the turkey unstuffed. I place my stuffing into baking dishes to bake. Also, see my Giblet Gravy (For Roast Turkey) for the best giblet gravy ever! During the last 10 or 15 minutes of cooking, increase temperature to 375 or 400 degrees F. to get more browning, but watch it carefully, as you do not want to burn it or dry it out. I really like the herb combination here. 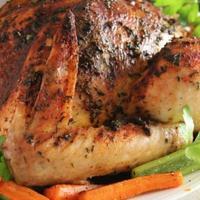 I have found using tarragon with poultry is a wonderful combination.